They were thinner than the later high pressure liners and tended to split under pressure. The colour of Second World War helmets was a dark olive green. Up until late 1943 the rim of the helmet was stainless steel with its join at the front. Due to this we are merely choosing to touch on the basics of what to look out for when identifying and dating an M1 helmet to the Second World War. Due to the smaller contract Schlueter helmets are quite sought after. The lining was quite unique for the period in being a separate body that slipped into the steel shell, as opposed to other helmets of the era, where their lining systems were either pinned, sewn or bolted to the shell. The liner is made from many parts. Wartime shells used crushed cork to diminish glare, creating a dimpled or goose pimpled appearance. They were secured to the helmet by folding their open ends into the steel pot, and then placing the liner inside, trapping the cloth between the pot and the liner. 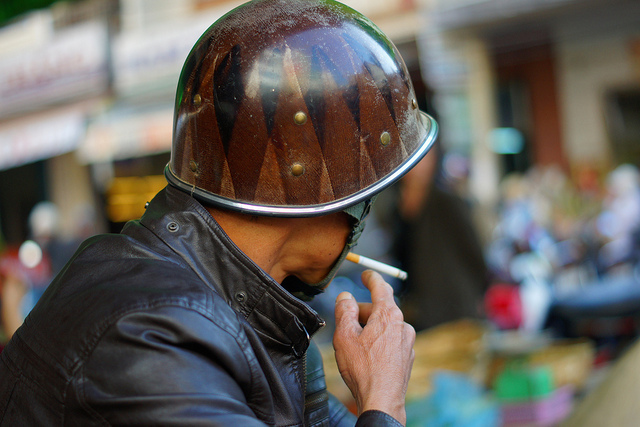 The M1 helmet has become an icon of the American military, with its design inspiring other militaries around the world. Copies made in 1958 known as Stahlhelm 2 M.
Currently used in non-combat operations. The European Woodland pattern was not reversible; they were only printed on one side, though some rare desert camouflage examples do exist. The most common makers seem to have been Capac Manufacturing Company and Westinghouse Electric Company. Beware of forgeries and reproductions. Most noticeably, the rear of the helmet has been raised to give more clearance for packs, etc. The last two important components of the shell, together with what has been mentioned above, should decide whether a shell is complete and wartime. Steel pots: the history of America's steel combat helmets 1st ed. A close up of the heat stamps. In the 1960s, the M1 helmet liner was redesigned, eliminating the leather chin strap, nape strap and a change in the suspension webbing to a pattern resembling an asterisk in a coarse cotton web material in lieu of the earlier herringbone twill. Take the 44 pack for example. The number in this helmet is most likely this type of identification. The paint tended not to stick to this rim and chipped off easily with many period M1s show this characteristic clearly. The first M1 helmets were produced with fixed chin strap bales, but due to breakages, the design was changed to a swivel bail in October of 1943. I learned my new thing for the day. This steel helmet has the characteristic front seam on the helmet rim. The design of exterior metal led to some novel uses: When separated from the liner, the shell could be used as an , a hammer, washbasin, bucket, and as a seat. In the , for example, it was common practice to use a square piece of as a helmet cover on M1 helmets, usually secured by a net see above and a wide rubber band. On the earliest shells the seam met at the front. They have herring bone twill webbing and adjustable sweatbands that could be unclipped and removed. However it is not uncommon to see scuff marks or scratches, especially on the exposed rivet heads. However in general terms the actual helmet design changed very little, and so identifying an example as being original World War Two may seem like a fairly challenging prospect. There are the remains of some sort of unit emblem on both sides of the liner, that have been painted over at some point. The nape area of the liner also had webbing with studs where a nape strap could be attached. Production was done by McCord Radiator and Manufacturing Company and Schlueter Manufacturing Company. The M1 Helmet of World War Two - A Basic Overview. Many soldiers wore the chinstraps unfastened or looped around the back of the helmet and clipped together. They were not issued to soldiers, so many soldiers simply made them from a white cloth from a shirt or tablecloth. The Hawley seems to have mainly been issued to the Pacific theatre and interestingly photographs document Airborne soldiers wearing the Hawley in their M1C helmets on D Day. The first liners were produced in June 1941 and designed by. This feature remained constant on all liners, but it is interesting that many liners are missing their nape strap. During the and Korean War, soldiers made white helmet covers as camouflage in snowy areas. A cork textured shell featuring a rear joining rim would also point to wartime, but such examples are less desirable for collectors as their front seamed counterparts. There is a unit designator painted inside the helmet that I have yet to decipher. I have seen photos of a post-ww2 liner with the number 51 stradling the top arm of the cross and 52 the bottom part. 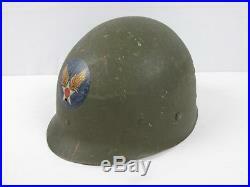 My helmet is set up with the 1950's era liner, which makes it correct for the Korean War. When you have zeroed in on a helmet, either from an online source, or better still, from somewhere where you can actually get your hands on the helmet, the first thing you should do is give the shell a good once over. The various elements of the suspension system are , later clipped, inside it. I do not know the model number but it is the type with criss-cross webbing and the strange nape strap. The liner body is hard and made up of a composite fibre material, which can take some flex but would split under too much pressure. The liner chinstrap is snapped or riveted directly to the inside of the liner and does not have bails like the shell chinstrap, but it still swivels inside the helmet. After the war and during the Korean War in particular, the method of attaching the strap to the helmet bales was changed, with the introduction of a new metal component, which clipped to the bale with the chinstrap snapped inside, thus making the helmet safer for the wearer in shell blasts. A second production run of about 1,000,000 was produced between 1966 and 1967. In service, reserve soldiers have used the M1 helmet in combat as late as 2006. The shell texture is also very important. After this point the rim changed to manganese steel, which was the same material as the shell, and the position of the rim join moved from the front to the rear. Through it lifetime minor changes and updates were implemented to improve protection and user experience, such as paint texture and colour, rim material and positioning, chinstrap bales, chinstraps and of course the liners. The M1 was phased out during the 1980s in favor of the , which offered increased and ballistic protection.